When it comes to the law of attraction the people behind manifesting.com tell you to forget the ask, believe, and receive rule and do something different, a 5-step process for manifesting what you really want. In their No-BS Manifesting Guide, they teach you a more scientific way to manifest the life you want. I’ve long been a fan of the ask, believe, and receive rule. But, I’ve also known that action is important to get what you want because, after years of wishing for certain things that never came, I realized that I have to take some things into my own hands in order to align myself with my goals. This guide is a PDF/EBook from Inspire3, the same company behind Subliminal Guru and Hypnosis Live. They can’t have come out with this too long ago because not long ago I had checked out manifesting.com and it was still in the ‘coming soon’ stage. 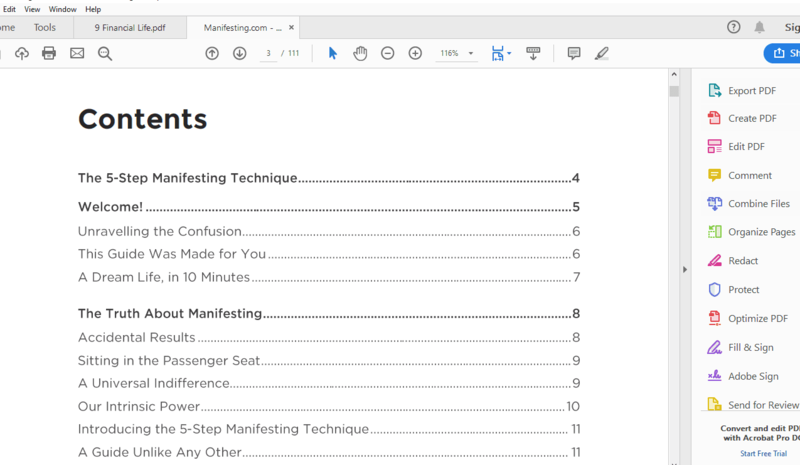 Now, it has a video on it where you can grab a manifesting cheat sheet. Yet, I already see a bunch of No-BS Manifesting Course Reviews out there, so people obviously think it’s worth talking about. I think most of us want the law of attraction to work for us. We want to attract wealth, great relationships, that car… or whatever else. The problem is that some of us believe that wishing hard enough will do the job, and it doesn’t. I know that after reading The Secret, which was my first introduction to the law of attraction and manifestation, it all seemed very magical and there were a lot of people, videos, articles, courses that supported that magical aspect. But, one thing I learned a long time ago, and I can’t remember who it was from – is that this is a physical world and while energy plays a big part in it, we need to also get physical in order to reap the rewards we want. That said, some crazy things have come into my life after ‘wishing’ for them and not taking action. But, maybe those were coincidences? Or maybe I had done some work to bring them into my life and didn’t even notice? Work like telling someone what I wanted or even hinting at it. 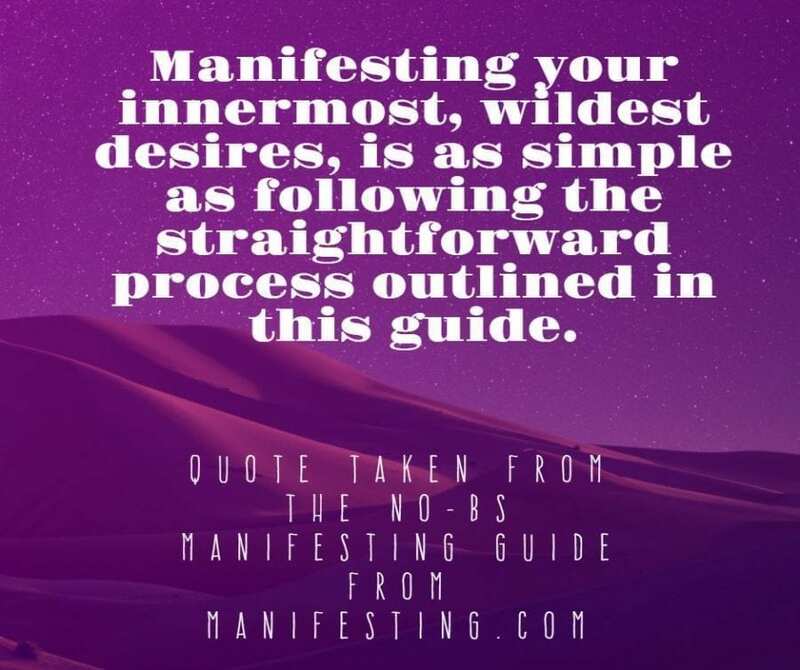 I guarantee if you are turned off by woo-woo stuff that normally comes with the Law of Attraction, but you still want to attract the life of your dreams, you will like the No-BS Manifesting Guide. Each step has scientific research to back it up and has been proven to work. In fact, you will read about people such as Deepak Chopra, Joe Vitale, and Rhonda Byrne, and why they are giving the law of attraction or the science behind it a bad name. They also talk about how going on blind faith that things will just materialize into your life is not a good idea because you can actually miss the opportunities that would help you manifest the life you want. The guide doesn’t have any stuff that is hard to buy into. Each chapter on the process has a story to illustrate the point being made, scientific support behind the step, why and how to activate the step, and a quick recap of the main points. It teaches you a straightforward way to manifest a more fulfilling life. No BS. At 111 pages, I read the eBook within a few hours. Speaking of woo-woo stuff, I always associate the number 111 with positive vibes or being on the right track. I’m assuming other people do that? Maybe Inspire3 knew that and that’s why they made the eBook 111 pages? I’m speculating. I don’t know for sure. I tried doing it on my own for a few days, but then I used the listen-along manifesting audio that comes with your guide, which basically walks you through the 5 steps. I like doing it that way better. The audio is 11:51 minutes long. The guy narrating is easy to listen to and helps you work through the 5-step manifesting technique easily. The only problem is that you don’t get as much time as you would like to reflect on each step. You have to move at the audio’s pace. But, I’ve made it work for me. I use my Goals on Track vision board during the process. So, not only am I doing the 5 steps from Manifesting.com, but I’m also visually seeing the pictures that correspond to my goals. If you buy the No-BS Manifesting Guide, I recommend you try this out too. Use some sort of vision board that helps you really visualize what you want to manifest better. There is another video that you get with your order, and it is focused on wealth. I really like this one too. The video is supposed to help you manifest wealth and abundance in all its forms. It’s called Mega Money Magnetism. It walks you through the 5-step system and has the pictures that correspond to wealth. Plus, it has this purple haze that makes the video that much more dreamy… visiony? I don’t know. But, I really like it. Basically, it helps you relax, get focused, and do the 5-step process focusing on wealth. But, I find that it’s very dreamy like, and I don’t want to do it in the morning because I tend to fall asleep if something is too calming. In the morning, I would rather focus on what I want to manifest and get pumped to manifest it, so calming doesn’t work for me. The images are nice in this video, but I know what I want to create. I have a whole Lifebook that clearly states my vision and I’ve combined my Goals on Track software with Lifebook. So the pictures on that vision board are all I need to see. These hypnosis bonuses complement the 5-step process because they affect your subconscious mind in a way that helps you do more of what you should do and less of what you shouldn’t do. You can listen to these once a week or however often you like. Basically, with the help of these hypnosis sessions, you rewire your brain and become someone who does what needs to be done to manifest the life you want. You get a law of attraction hypnosis from the Hypnosis Live collection. I think pretty much everyone will like this track. You also get a bundle hypnosis session from Leslie Riopel. But, I couldn’t listen to this woman. Maybe it’s just the wrong time of the month for me, but her vocals are annoying, not soothing. It was impossible for me to listen to her because I couldn’t get past her weird up and down, loud and quiet tone. Another bundle that I was able to listen to was by Stuart Ashing. He was very easy to listen to. This hypnosis bundle helps you take on a new story for size and shows you the difference between what you are doing and what you could be doing. In other words, it helps you see the facts that are in your control. I really liked they hypnosis by Catherine Jackson, as well. She has a nice, soothing voice that is easy to listen to. I found that this hypnosis had some positive affirmations that can help you transform your mind to understand that you have the ability to manifest what you want. The Manifesting Autopilot Hypnosis Audio helps you to reprogram your mind to follow the 5 step process easily and naturally. It is meant to transform you into a person who takes massive action and makes things happen. 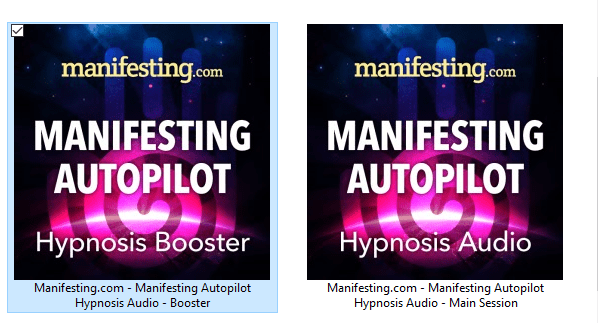 And the Manifesting Autopilot Hypnosis Booster is meant to help boost the results you got from the first Manifesting Autopilot Hypnosis audio. I liked both of these. I love Inspire3 because they base all of their products around science. They don’t tell you that something will work, just because it will. They give you the science behind what they are selling, and then you experience the benefits for yourself. In short, they are about action and creating the life you want with the help of tools that create the right mindset. And this No-BS Manifesting Guide and hypnosis sessions, helps you create that right mindset and start taking real action that moves you closer to what you want to manifest. It’s one of the real guides or courses that will help you make the law of attraction work for you. There are some other things you get with the No-BS Manifesting Guide, including some songs, videos, and short guides. You actually get quite a bit for the price you pay. I know many courses with as much information that cost much more. If you are interested in the 5-step process from Manifesting.com, you can learn more about it and download a cheat sheet here. Manifestation Miracle Review: Will Destiny Tuning Help You Manifest Your Dreams? Do You Currently Use Positive Affirmations?